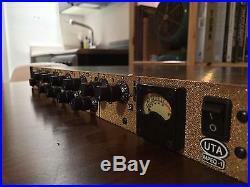 Is the amalgamation of the UTA EQ and UTA's new custom mic pre. You can use the equalizer and the mic pre separately or as a complete channel strip. 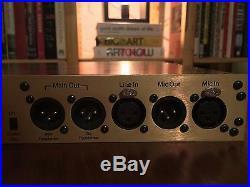 The mic pre has a custom input transformer and a carefully chosen output transformer. Both are optimized to accentuate the most flattering sonic qualities inherent in audio transformers. The unique mic pre design makes both of the transformers bypass-able. This offers users a choice between the detailed clarity of a Class-A transformer-less design or the vintage musicality of a dual transformer mic preamp. I also have #16, which is a matched unit. Ability to use mic-pre and UTA EQ on separate signals. 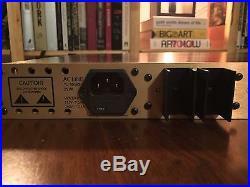 EQ Line Output - w/ output transformer. 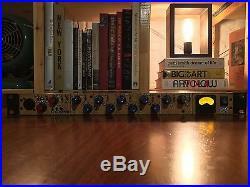 EQ Line Output - w/o output transformer. Mic In transformerless: 2K ohms. MIc In 200 : 2K ohms. Main Out with Transformer: 120 ohms. Mic Preamp: 10 Hz - 80 kHz +0 /-1 dB. Line In/Out: 10 Hz - 50 kHz +0 /-1 dB. 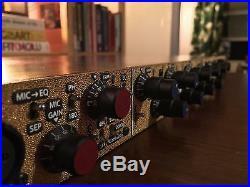 Mic Preamp: -128 dBu (20 Hz - 20 kHz). Line Level Circuit: -91.5 dBu (20 Hz - 20 kHz). 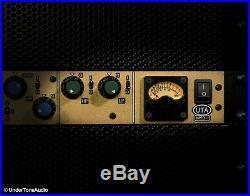 Mic Preamp: +27 dBu (or better). Line Level Circuit: +27 dBu (or better). Front to Back: 12.25 (with heat sinks and knobs: 14). Left to Right: 17.25 (with rack ears: 19). The item "UnderTone Audio MPEQ-1" is in sale since Sunday, October 23, 2016. This item is in the category "Musical Instruments & Gear\Pro Audio Equipment\Preamps & Channel Strips". 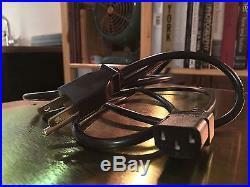 The seller is "kdal1065" and is located in New York, New York. This item can be shipped to United States, to Canada, to United Kingdom, DK, RO, SK, BG, CZ, FI, HU, LV, LT, MT, EE, to Australia, GR, PT, CY, SI, to Japan, to China, SE, KR, ID, to Taiwan, TH, to Belgium, to France, to Hong Kong, to Ireland, to Netherlands, PL, to Spain, to Italy, to Germany, to Austria, RU, IL, to Mexico, to New Zealand, SG, to Switzerland, NO, SA, UA, AE, QA, KW, BH, HR, MY.